The Rolling Stones’ first eponymous extended player was the third record release by the band, after their debut single, “Come On” and the follow-up “I Wanna Be Your Man”. The EP came out as the Stones began their second package tour, where they joined the Ronettes for fourteen dates. Among the four tracks are “You Better Move On”, played nightly on the tour, as well as on Top of the Pops two weeks after the EP’s release, and “Poison Ivy” that was originally intended to be the second UK single, but was withdrawn prior to going on sale. 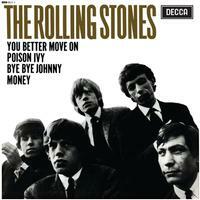 Like all the band’s material at the start of their career, all the tracks are covers and include the Stones take on “Money”, a song that also featured on the Beatles second album.